In a world of rocks, road debris, bird droppings, bug splatter, UV rays, acid rain, and a host of other environmental contaminants, what’s a new car owner to do? The road fights against the look and quality of your car’s paint. How can you and your car fight back? The most comprehensive form of automotive paint protection is Paint Protection Film (also known as Clear Bra). Paint Protection Film is a urethane covering that is wrapped around a car’s exterior to provide a line of defense against environmental hazards. A quality film will prevent rock chips, resist chemical stains and etching, guard against oxidation, and even self-heal from small scratches and disfigurements. If you are looking for a way to keep your car looking better for longer, Paint Protection Film may be the end of your search. And here at FTA Styling, we are the premiere Paint Protection Film destination in Salem, OR. Learn more about the history and technology behind Paint Protection Film, or schedule an appointment today. Guards against chips and scratches caused by rocks and road debris. Invisible finish, enabling clear and glossy paint. Individually computer cut for your specific year, make, and model. Installed by expert technicians for a quality, seamless finish. Paint Protection Film is the most comprehensive form of defense you can establish between your car and all that can damage your car’s appearance. 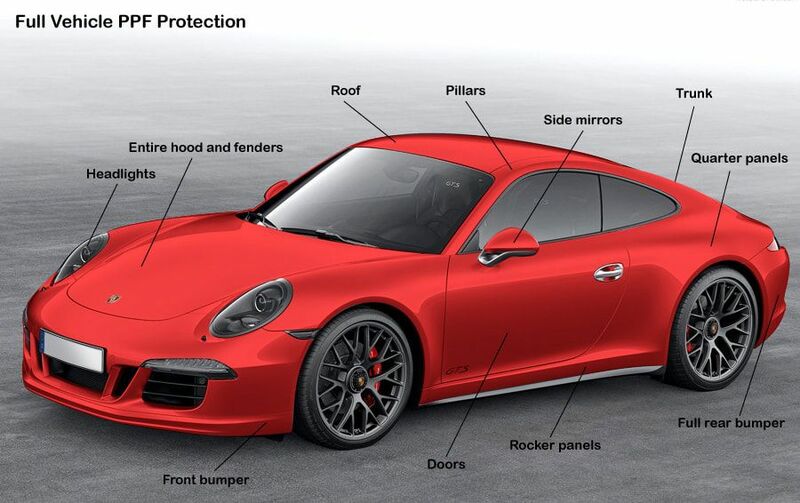 You can choose to wrap highly vulnerable areas, like the hood, front bumper, rocker panels, or rear wheel arch. Or wrap the entire vehicle for maximum protection. In the images below, red indicates the covered areas.